Scientists are a strange bunch. I know, I’ve worked with a few in my time. Take this machine for example (pictured right). No, it’s not the latest midi hardware for plugging into your keyboard to make next level beats and neither is it used by the US government to torture Al Qaida subjects in Guantanamo despite its name. No, the Panlab Startle and Fear Interface LE 118-8 “is a polyvalent system for conducting both fear conditioning and startle reflex experiments in one same enclosure”. But that’s not all. Sounds great, but what’s it for? 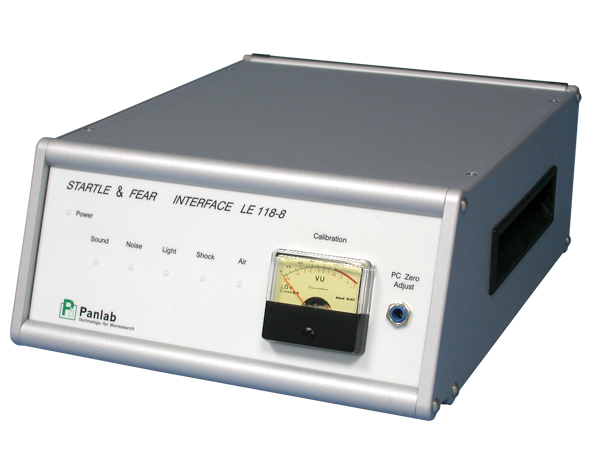 The Startle and Fear Interface is essentially a sound-proof and darkened chamber where a rat or mouse is immobilised. A tiny sensor then records the movements of the mice under different conditions, such as by producing sounds to initiate a so-called startle response. In particular, the sounds used to trigger this response work on the concept of “Pre-pulse Inhibition” or PPI. That is, if you suddenly hear a loud sound, you initiate a startle response, but the startle response can be minimised by providing a pre-pulse at lower intensity which essentially conditions or warns the nervous systems of potential impending activity. This phenomenon of PPI is often severely inhibited in schizophrenia particularly, Alzheimers and also under the effects of some drugs. In other words, PPI is effectively a gating process that when it works aberrantly interferes with the brains filter that controls entry and processing of irrelevant sensory information. Measuring the startle and fear responses in rats and mice allows researchers to test and develop new treatments for these diseases as well as test the cognitive effects of some drugs. It appears though that the startle and fear response may also play an important role in the perception and synergy of electronic music with use of drugs like MDMA. In an intelligible, elegant and succinct paper DJMonkey explains the phenomenon in pharmacological terms. In this sense, it can be interpreted that use of MDMA induces a temporary synthesis of a partial schizophrenic state and that much of the technique and production of electronic music is consciously and at times unconsciously designed to capitalise on physiological effects such as the loss of PPI. In a similar vein, Simon Reynolds thinks that the music and the drug have evolved symbiotically, one promoting the evolution and survival of the other based on this ability for one to enhance the other and vice versa. One wonders how the phenomenon of PPI also relates to the recently overblown “craze” for “i-dosing” a high produced by listening to specific tonal sounds downloaded from the internet called “binaural beats”. These downloads play one sound in one ear and a different sound in the other ear to produce perceptional and physiologic effects that are allegedly capable of intoxication that obviously has the authorities and parents worried. One vendor is clearly working the drugs angle in trying to sell their product. The sounds of i-Dosing are essentially ambient-drone works, embellished with glitch and white noise elements and extended panning and phasing techniques to unbalance the senses. As mentioned, the marketing of some i-doses with drug names is also a controversial aspect of the music, and is obviously more likely to have provoked problems with the authorities and parents than the effects of listening to the music. The combination of this kind of branding with the effects means that many consider i-doses to be so-called “gateway drugs” that will lead to harder things. If one compares this kind of music to the likes of Eliane Radigue, for example, there is little if any difference other than marketing. Indeed, Radigue attempts to insert Buddhist and transcendental elements from her beliefs into her music to produce essentially the same effects, but to less awkward social consequences one imagines. Similar techniques have been used by other artists to convert visual data recordings into sound output, for example, Japanese ambient legend Tetsu Inoue’s 1998 piece “Waterloo Terminal” based around scans of the schematics of the buildings that were then turned into sound. There has also been a few articles recently touching on the contribution of music to medicine. The Guardian recently ran an article discussing the apparent benefits being observed in Istanbul from the ancient Islamic tradition of music therapy. In a recent issue of The Wire the feature article described the BBC Radiophonic Workshop co-founder Daphne Oram’s New Age ideas for electronic music, who’s manifesto was written under the title “Atlantis Anew” in homage a Sir Francis Bacon. As one way to realise her vision, Oram left the BBC and with the help of Graham Wrench developed the Oramics machine, recently on display at the London Science Museum, which was capable of turning written wave form information into sound via the Oram-designed interface. Sadly the use of her Oramic’s machine was mostly limited to artistic purposes and not to healing therapies. But from the humble stethoscope to the latest i-dose it may be that there is yet an untapped medical potential in sound and music therapy.